The debate over guns in America has surged again to the forefront of conversation in the wake of the horrific school shooting in Florida last week. A deranged gunman went on a rampage through the Stoneman Douglas High School in Parkland, Florida, killing 17. Many are calling for stricter gun laws in the wake of the shooting. One of the students of Stoneman Douglas said this weekend that his coach, who died in the shooting, would have then able to confront the gunman had he been able to carry his firearm to school. While the idea of arming teachers is a controversial one nationally, a school district in Texas has been arming their teachers for over 4 years. The Argyle School Independent School District decided in 2014 to allow highly trained members of staff to carry guns on campus to prevent mass shootings. 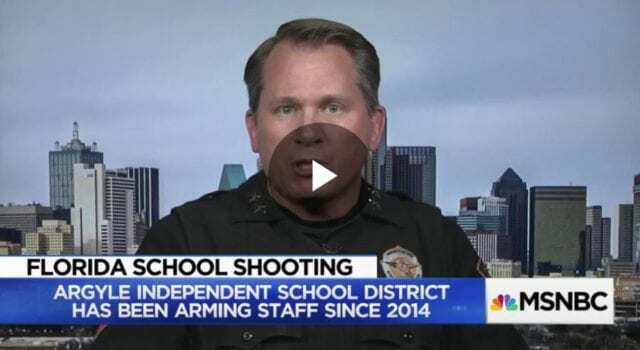 On MSNBC this weekend, Sheriff Paul Cairney of Argyle, Texas, described the process by which staff members can carry firearms in the school district. The Sheriff said that the staff at the school who choose to carry a firearm go through an intense round of interviews and training before they are allowed to carry on campus. The MSNBC host was flabbergasted at the practice and asked the Sheriff about concerns for the safety of the students in the school when there are firearms around. Previous articleTeachers and Staff Should Be Packing Heat at Schools, Churches, Etc.